This article is about the shape and mathematical concept of circle. For other uses of the term, see Circle (disambiguation). 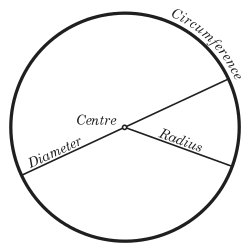 In Euclidean geometry, a circle is the set of all points in a plane at a fixed distance, called the radius, from a given point, the center. The length of the circle is called its circumference, and any continuous portion of the circle is called an arc. A circle is a simple closed curve that divides the plane into an interior and exterior. The interior of the circle is called a disk. Mathematically, a circle can be understood in several other ways as well. For instance, it is a special case of an ellipse in which the two foci coincide (that is, they are the same point). Alternatively, a circle can be thought of as the conic section attained when a right circular cone is intersected with a plane perpendicular to the axis of the cone. All circles have similar properties. Some of these are noted below. For any circle, the area enclosed and the square of its radius are in a fixed proportion, equal to the mathematical constant π. For any circle, the circumference and radius are in a fixed proportion, equal to 2π. The circle is a highly symmetrical shape. Every line through the center forms a line of reflection symmetry. In addition, there is rotational symmetry around the center for every angle. The symmetry group is called the orthogonal group O(2,R), and the group of rotations alone is called the circle group T.
The circle centered at the origin with radius 1 is called the unit circle. A line segment that connects one point of a circle to another is called a chord. The diameter is a chord that runs through the center of the circle. 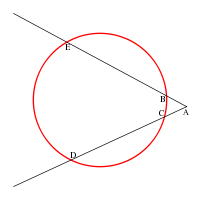 The diameter is longest chord of the circle. 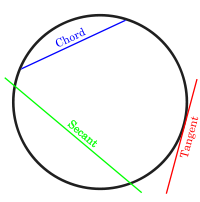 Chords equidistant from the center of a circle are equal in length. Conversely, chords that are equal in length are equidistant from the center. A line drawn through the center of a circle perpendicular to a chord bisects the chord. Alternatively, one can state that a line drawn through the center of a circle bisecting a chord is perpendicular to the chord. This line is called the perpendicular bisector of the chord. Thus, one could also state that the perpendicular bisector of a chord passes through the center of the circle. An inscribed angle subtended by a diameter is a right angle. 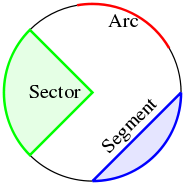 The sagitta is a line segment drawn perpendicular to a chord, between the midpoint of that chord and the circumference of the circle. The line drawn perpendicular to the end point of a radius is a tangent to the circle. A line drawn perpendicular to a tangent at the point of contact with a circle passes through the center of the circle. Tangents drawn from a point outside the circle are equal in length. Two tangents can always be drawn from a point outside of the circle. If the angle subtended by the chord at the center is 90 degrees then l = √(2) × r, where l is the length of the chord and r is the radius of the circle. If two secants are inscribed in the circle as shown at right, then the measurement of angle A is equal to one half the difference of the measurements of the enclosed arcs (DE and BC). This is the secant-secant theorem. where , are the coordinates of the common point. where t is a parametric variable, understood as the angle the ray to (x, y) makes with the x-axis. It can be proven that a conic section is a circle if and only if the point I(1,i,0) and J(1,-i,0) lie on the conic section. These points are called the circular points at infinity. 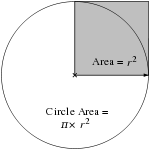 In the complex plane, a circle with a center at c and radius r has the equation . Since , the slightly generalized equation for real p, q and complex g is sometimes called a generalized circle. It is important to note that not all generalized circles are actually circles. provided that , of course. that is, approximately 79 percent of the circumscribed square. So the circumference is equal to 2 times the area, divided by the radius. This can be used to calculate the circumference when a value for π cannot be computed. 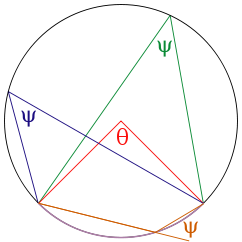 An inscribed angle is exactly half of the corresponding central angle (see Figure). Hence, all inscribed angles that subtend the same arc have the same value (cf. the blue and green angles in the Figure). Angles inscribed on the arc are supplementary. In particular, every inscribed angle that subtends a diameter is a right angle. 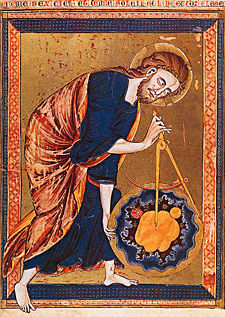 Apollonius of Perga showed that a circle may also be defined as the set of points having a constant ratio of distances to two foci, A and B.
Analogously, a line segment PD bisects the corresponding exterior angle. Since the interior and exterior angles sum to , the angle CPD is exactly , i.e., a right angle. The set of points P that form a right angle with a given line segment CD form a circle, of which CD is the diameter. As a point of clarification, note that C and D are determined by A, B, and the desired ratio (i.e. A and B are not arbitrary points lying on an extension of the diameter of an existing circle). Altshiller-Court, Nathan. 2007. College Geometry: An Introduction to the Modern Geometry of the Triangle and the Circle. New York, NY: Dover Publications. ISBN 0486458059. Pedoe, Dan. 1997. Circles: A Mathematical View. Washington, DC: The Mathematical Association of America. ISBN 0883855186. Interactive Java applets – for the properties of and elementary constructions involving circles. Interactive Standard Form Equation of Circle – Click and drag points to see standard form equation in action. What Is Circle? – at cut-the-knot. This page was last modified on 22 February 2017, at 17:33.